Discussion in 'Journals' started by Miss-Pepper, 13 Feb 2019. Me and my partner have reinforced a Hombase unit (similar to Ikea Kallax) with 18mm plywood top and back and covered with contact paper to prevent any splashes ruining the stand. 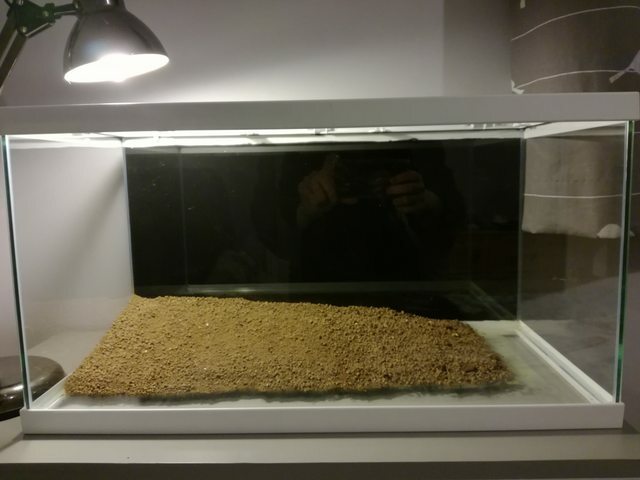 The filter is quite bulky but I'm hoping to have a lot of plants crammed in here which will cover it up! Depending how sensitive my OH is to the noise we might not use it anyway but it does hide the heater nicely. 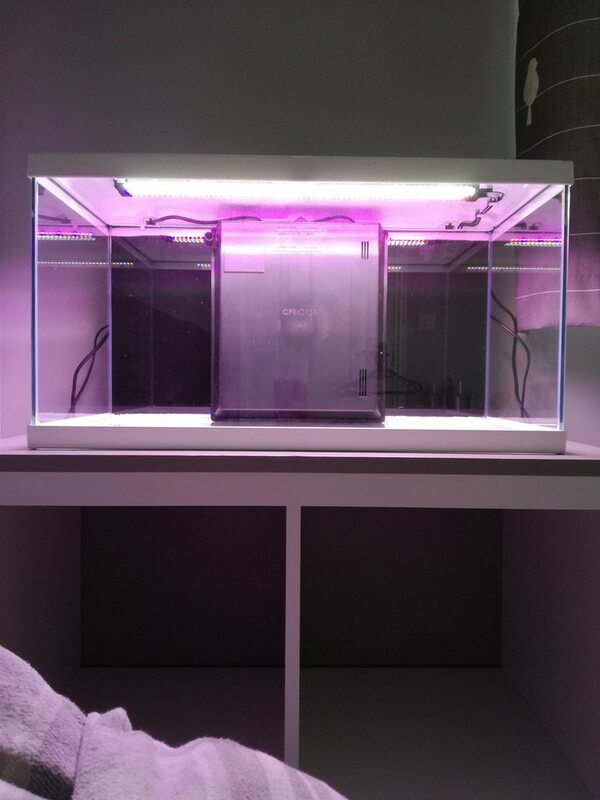 It has one 8W LED strip, and I've bought the additional 8W plant LED strip to go with it. Now, I need to sort out my digital timers. I'd like to be able to see into the aquarium when I get up in the morning for at least an hour or so, and then again in the evening when I'll be home from work. How would you guys set it up? 7-9am in the morning, and then a solid block from 5-10pm? I can time both lights separately so it doesn't always have to be so bright. Thanks for any input! A split photoperiod is fine, I'd split it as evenly as possible, but whatever suits your lifestyle will be fine. Just make sure the total is no more than 6 hrs/day to start with until your plants have become established and your tank matured. And then you can gradually increase it to around 8hrs if you want to. Great thank you! 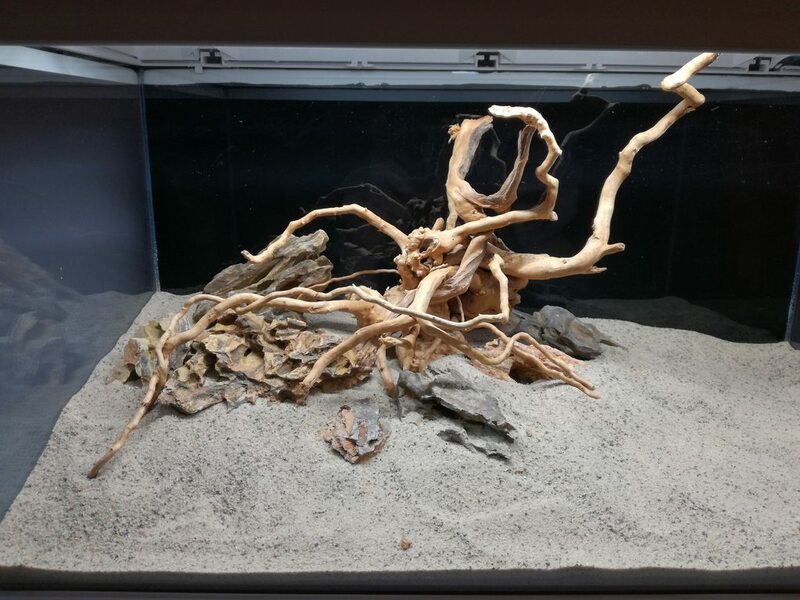 I will just put them on 6 hours to start and increase slowly as the tank matures at least I have the ability to half the brightness if I want to experiment with extending the photoperiod without triggering algae. Uh-oh! Who designed this light's plug are there any timers this would still work with? You could use a two-way adaptor as a spacer between the two. Oldguy and Miss-Pepper like this. I would pop them on a timer separately, so one comes on/goes off a little before/after the other. That will increase/decrease light gradually and is nicer to wake up to that a sudden brilliant glow. I would split it so you have a morning and evening light period so it's on when you are there to see it. Some timers have a flatter face/timer unit above the socket so you should be able to find ones to fit the plug. Double check the tank instructions to see if you are meant to use a mat under it. It doesn't look like it's sitting flat but that might just be the trim. 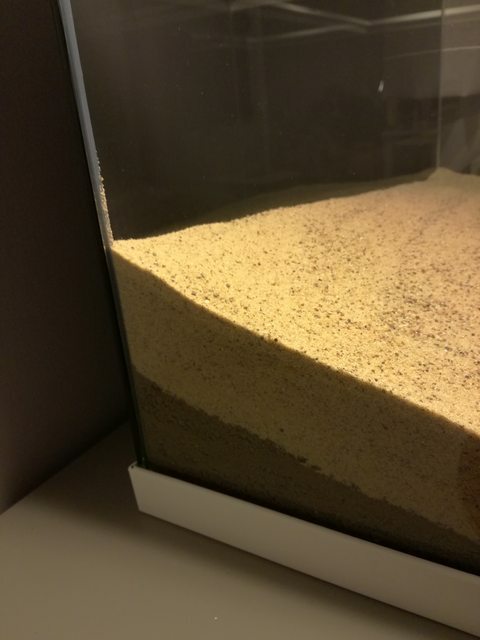 You can fill the tank and run the filter to how the noise is, there are small sponges that would work as an alternative or you could go filterless. 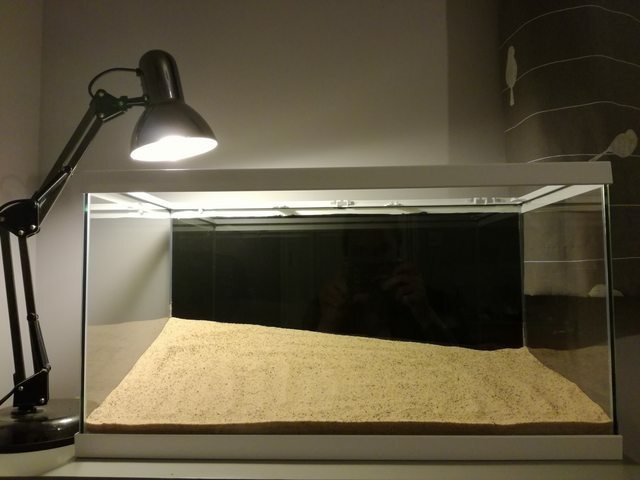 The filter (or not) choice will influence how you arrange what you put inside so I'd test that with a few night now before you set it up properly. Hi Tam, yeah I was thinking of doing the white light mostly, and the pink light an hour after and then an hour before the white light goes off? Or even less than that? I'm not a huge fan of the pinkish colour personally but someone said it would be better for the plant growth. The glass is actually suspended, so stops a few cms before the stand but supported by the rim if that makes sense? I'm sure the stand isn't 100% flat so would getting a mat help or not really if the glass isn't touching it anyway? Think I'll fill it up tonight and test then thanks! Pink might look ok when combined with the white? If not you can always swap out for a second white or a blue if you prefer that in future. No, the problems come from people overloading their extensions, you won't do that. You've got an 8W lamp, two if you get the extra one, a filter, probably about6 or 8W, heater maybe 100W. Add a bedside lamp and its still well under 200W. A lot of timers are rated at 2000W, others at 3000. Extension leads and two-ways adaptors normally 3000W. So you've got plenty of spare capacity. dw1305 and Miss-Pepper like this. What type of connector is at the "light" end of the power cable? 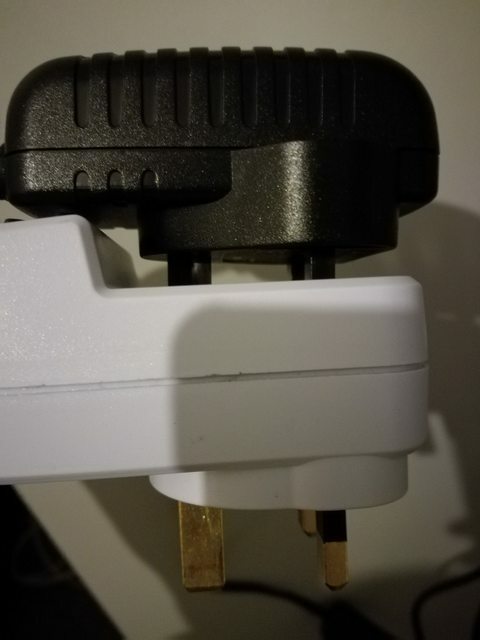 The connector, if any, that plugs in to the light itself or that joins the light's power cable to the power supply's cable from the plug. If you don't know the name, a pic of the two ends disconnected but visible. The reason for asking is I have bought a timer which fits into the power cable instead of the standard "push into power plug" type like in your pic. If your connector is the same, I can provide a link. Then you don't need to rely on the bulkier ones and the power supply can go straight into the muti-plug / socket. Double checked and couldn't see anything about that, so hoping that's all good! Pink looks fine with the white, and it is growing (heh) on me for a night time colour actually. Does it matter which one is on longer than the other? I tried to get the hum of the filter as quiet as possible, but so far has approval but we'll sleep on it and see what we think. Weirdly the lid of the filter made it louder, I guess more vibrations so will have to play with it and see what can be done as I don't want fish to end up inside it! Great, thank you for that clarification and solution! You'll need to check the size of the connector. Adapters are available from RS Components and probably others but be careful that you can get the right size and that they are compatible with your light unit before you buy anything. Also the one I bought came from China and cost £10 (I made an offer of £10.01 which was accepted). Here is the link. Other Ebay sellers are also available. These are the ones which were previously referred to as "Hinterfeld". There are two types of these. I bought the "pro" version which allows for smooth phasing in / out the lights. There is also a standard one which steps the lighting up / down. They also have 8 time settings so you will probably be able to do your two light periods per day. I've not done a check on that but probably. If you're interested, I'll get you more details. I'm not the seller or connected in any way. Thanks Michael! Does the pro version dim all LED? Are all LEDs dimmable? I might have to upgrade at least one of the timers for the phase element alone. Does the pro version dim all LED? I would say that it will dim all lights that can be connected (DC connection of 5.5mm) and fit within the limits it has (36V / 100W max). The "DC connection" has a more correct name (I don't know what that is) but it does look like what you have. They come in different sizes. This one fits my light without using an adapter. I saw a video where it was used with a Twinstar LED but needed a (cheap and small) adapter to allow it to fit. You'd need to check what size your connectors are and that you can get an adapter. I don't know myself for sure. My layman's feeling is "yes" but I know that some light bulbs you buy for home use are not dimmer able while others are. I knew my own was before buying and was prepared to take the risk given the low cost. For me, the reason to buy a dimmer was to be fish friendly with a phased sunrise instead of the timer switching the light on at the full strength it was to be used at. I also want to use my light at lower than full strength. Or at least have the ability to start low and increase intensity over time. A bonus side effect was that I don't need to use a power plug timer so have more space on my multi plug / in my cabinet and also less risk of a failure / fire starting. My old timer was getting warm but I only discovered this when reorganizing my power cables in readiness for my new setup. Had I not started that, I don't know if it would ever have caused an issue... I may be preventing a problem that may never have happened but I prefer to have the peace of mind. If you have two lights then you'll need two timers unless one power cable can supply both lights - probably not. Are you in the UK? If so, I'm in Kettering but travel regularly to Grimsby. If you want to get a feel for this item / check if it plugs into your light, I can easily show you or let you borrow it to try. I'm a few weeks away from needing to do my setup. If you buy one (or two) of these, you' need to allow 10-20 or so days for delivery. Go to about 4min for the bit about the controller. In that vid he had them controlling a Twinstar 600S (with a small / cheap adapter) but also mentioned the Twinstar 600E which does not need an adapter. I can't say with 100% certainty but it looks like they are the same as the ones still available from China on Ebay from a few different sellers. Judging from the ebay pics only , they appear to fit the Chihiros A Series without the need for an adapter. They are a little cheaper than the Chihiros Commander, take an estimated two to three weeks to arrive but only cost about £10 - £14 incl delivery. At that price, they are below the duty and import VAT thresholds. I've made an offer on one (S2 Pro model) and will see how that progresses. Shout if you want more details. Hi @SteveMcD, Yes that is the one. Please don't take the item location and delivery timeframe literally! The actual location is likely to be China and it may not make it within the estimated 10days. I chose a different seller who seemed to be more transparent with a Shenzen location. The one I chose was offered for £10.99 and also had the "Make an offer" button. I did so for £10.01 which was accepted (incl shipping). I see now that others are listed below £10!! Mine has been shipped albeit that the advertised delivery of 6th - 15th Feb (2 - 3 weeks) was changed after purchase to around "4 - 6 weeks for the UK". It's not a problem for me as I still have some items to sort out before I set my tank up anyway. Having said that, I could not see any of these that I was confident as being located in the UK so as long as you're not in a rush, you're ok with buying from abroad. I can't remember if I mentioned, but whichever one you buy, I went for the "S2-Pro". The S2 does stepped dimming and the pro does a gradient. For me, the main goal is to avoid startling the livestock and I think gradient is better for that. Plus also being able to dim without using the full strength will probably be necessary in my planned setup. At least that is the plan! Hi @SteveMcD, This is just an update to say my S2-Pro controller arrived today. Much earlier than any of their projected dates which is always a good thing. Tested tonight and works fine. Was not exactly as I had expected but simple enough to set up and does a good enough job for what I need. The only issue which is not as expected is how quickly it does the sunrise and sunset "phasing". I thought if I set a ten minute (just for testing purposes) sunrise, it would evenly divide the period up and divide by the difference between start and end intensity. It gets the start time right as well as the start and end intensity but did the "phasing" in much less time. The same with the "sunset". It might be me making a mistake with the settings. 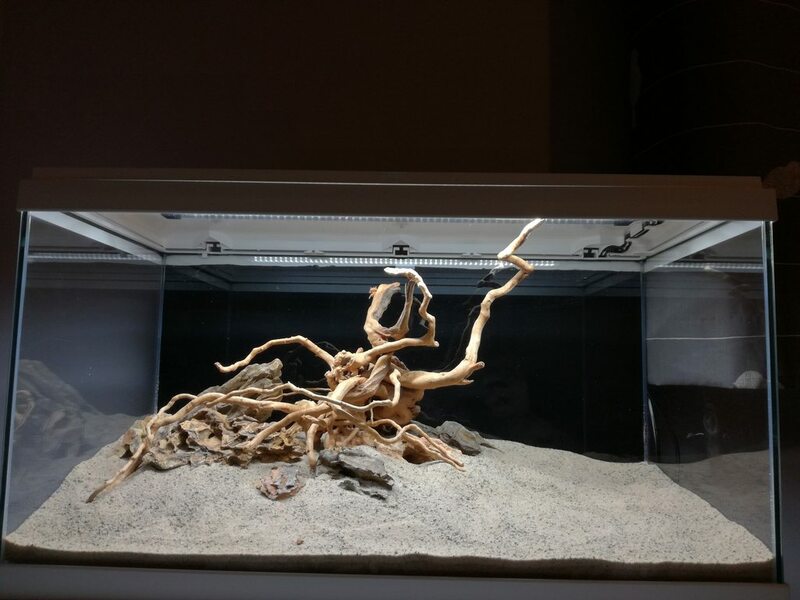 Having said that, it does the job I bought it for so I don't have complaints and will play with it a bit more in a couple of weeks when I plan to do the tank setup. Another good thing is I can do away with a power plug timer which is better from a safety point of view. And are much bulkier than I like too. So, a + I had not planned for originally. Also, plugged in perfectly to the Chihiros' cable. Thanks Michael, I've ordered one from another e-bay seller (your link was out of stock) for just under £10, so worth a try! If it fits I'll get another one. Tested the filter, and while there is a definite white noise kind of hum we've both decided it's tolerable! I woke up a few times in the night, as I always do, and couldn't hear it at all until I thought about the fact I couldn't hear it haha. I know an eheim external would be quieter than that internal though, so if anyone needs absolute silence I don't recommend Ciano's. I also have a few gripes with the tank itself, I noticed quite a deep surface scratch on the back when I painted it, but I've just noticed one right at the front today and a smudgey silicone(?) mark on the side panel. Bit disappointed but we bought the tank in October last year! 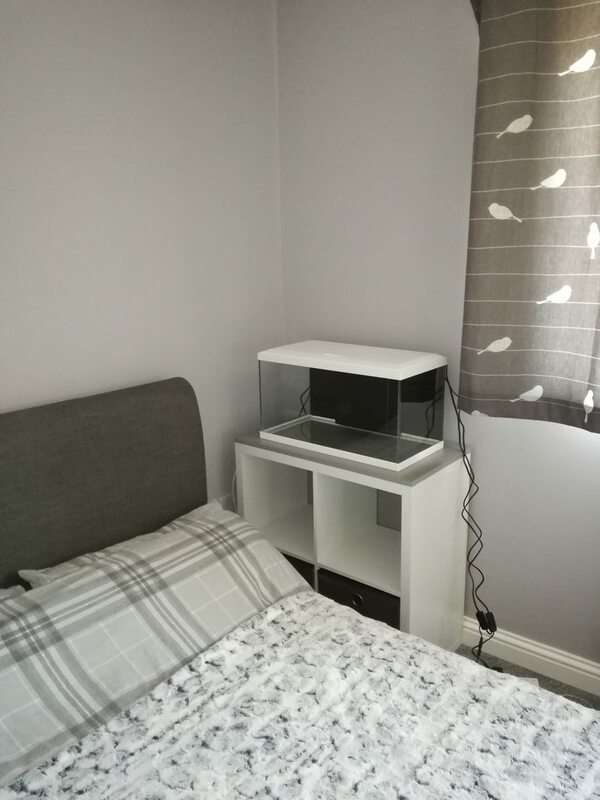 So not sure they'll believe I've only just set it up and it's got a scratch on it You get what you pay for and this was pretty cheap and cheerful. It fits the bedroom's decor though, and I'll probably not notice these things after a while! 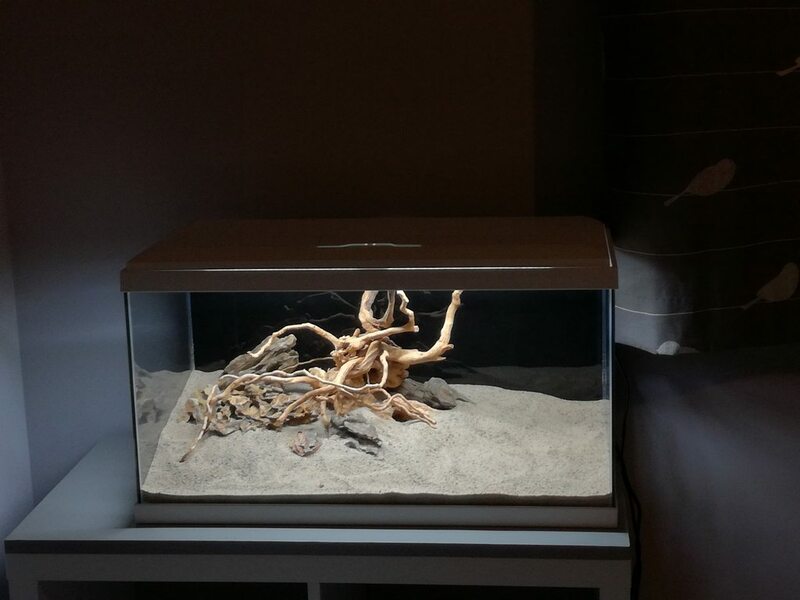 Anyway, time to play with my hardscape! Doesn't matter which light is on longer than the other - it's only for your viewing/less sudden morning wake ups so whichever looks good to you. Vibration is where you get noise so playing around can help it, usually if you press on something and that changes it in a good way then you can fix it with something heavy or adding a little rubber trim etc. depending what's moving against what. I don't know what the filter inside looks like but if the top doesn't work then jamming it with a sponge is pretty good at keeping fish out of things. Miss-Pepper and DutchMuch like this. Well I had a complete change of heart about the filter! I started building up the substrate and it became clear the inlet was going to be too low down I tried moving it to the right...but then the plugs didn't reach to the sockets soooo I have just removed it! 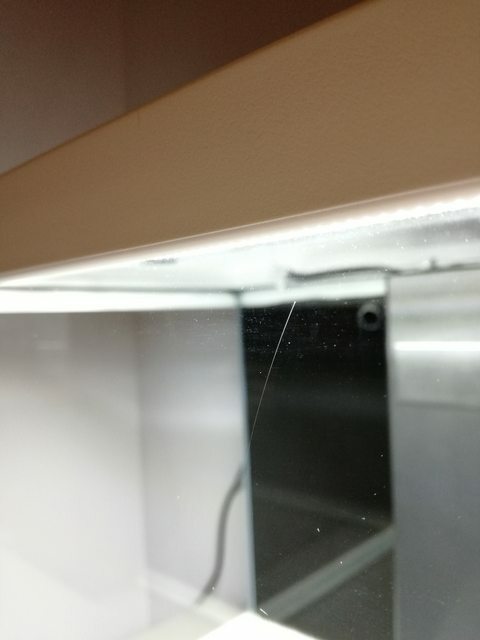 I think I will get a small nano corner filter, or similar, just to add flow to the aquarium and instead rely more on the plant's ability to filter the water. I've played around with my piece of spider wood and dragon stones every which way haha (I have more stones if needed) but if anyone has any recommendations to improve it please go ahead! I've sloped it up so much so I can see more of the back from low down but it has taken up quite a lot of room! I want quite a thick 'jungley' planting on the left and thinning out to the right and front so some of the rocks might get hidden anyway. Thanks for any help guys! Jayefc1, Filip Krupa, russchilds and 1 other person like this.